1988 massacre of 30,000 political prisoners in Iran remains unpunished. 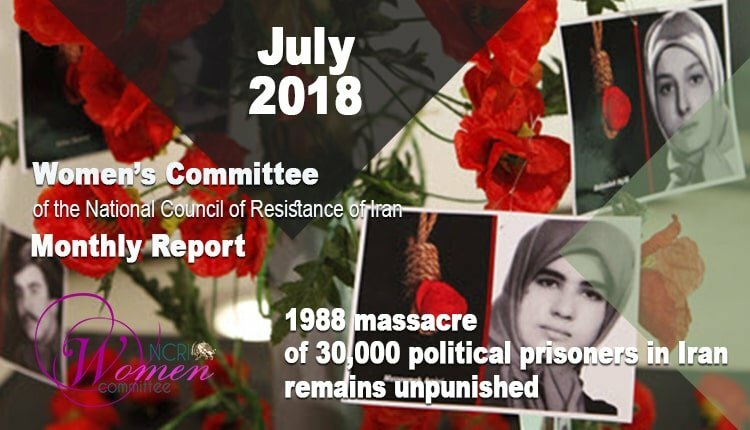 The final days of July serve as a reminder of the worst crime against humanity since World War II, the 1988 massacre of over 30,000 political prisoners in Iran. The killings were not only horrific in scale, but remains shrouded in mystery with the regime blocking all attempts to investigate the extent of the massacre. The vast majority of the victims of the 1988 massacre were supporters of the People’s Mojahedin Organization of Iran (PMOI/MEK), the main Iranian opposition. The massacre, however, extended to members and supporters of other political groups, in later stages. The extrajudicial executions started in the last week of July, peaking on July 28 until August 14, and continuing on to autumn and even the following year in some places. The overall picture of the 1988 massacre is totally inadequate because the massacre was extensive, carried out in prisons all across the country. In some instances, there were no survivors. For 28 years, the Iranian regime officials refused to acknowledge the executions, or provide any information as to how many prisoners were killed in the 1988 massacre. The regime continues to suppress any information about the killings, arresting family members who dare to speak out or visit mass graves at the Khavaran cemetery. Every information regarding the massacre is considered top secret. So, what is known about the massacre has been extracted and pieced together from the limited number of reports by survivors, families who were called to collect the bodies of their loved ones, as well as from scattered acknowledgments made by the regime’s officials. Two years ago, when the Maryam Rajavi launched the Call-for-Justice campaign for the victims of the 1988 massacre, some officials came out to defend the crime against humanity, and at the same time, revealed new information. A report on the 1988 massacre prepared by human rights barrister Geoffrey Robertson notes, “the killings compare with the 1995 massacre at Srebrenica in terms of the vulnerability of the victims, and they exceed it when measured by the cold-blooded calculations made at the very pinnacle of state power.” Robertson points out that the evidence of international crimes committed by the regime during the massacre are such that the 1948 Genocide Convention imposes a duty to investigate the massacre.